Inspired by the colour blue, this photo collage contains sky, sea and everything in between. Wear it on days you’re hoping to encounter something or someone completely unexpected. 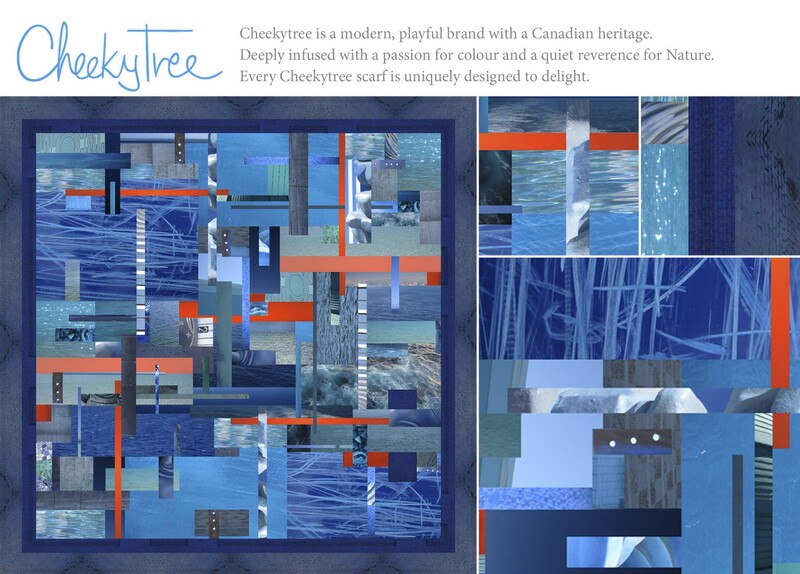 This entry was posted in art, fashion and tagged designed in Toronto, limited edition, Made in USA, photo collage, photo montage, scarves, textile design by Lila Cheekytree. Bookmark the permalink. Spring collection in the next few months. I hope to be able to see these beautiful wearable art pieces very soon. Spring will be here before we know it! Thanks Kim. I’m keeping very busy creating new designs. Truly brilliant – in all senses of the word! Thanks so much Carol. And you are one of the very few who have actually seen and touched them. LOVE ALL THE COLORS YOU CREATE, HAVE NOT SEEN ANYTHING NICER, ANY WHERE. Thanks Marilyn. That’s one of the cool things about digital textile printing, it allows unlimited colour.